Amar Seva Sangam-Ayikkudy (ASSA) has a way of embracing and inspiring you. 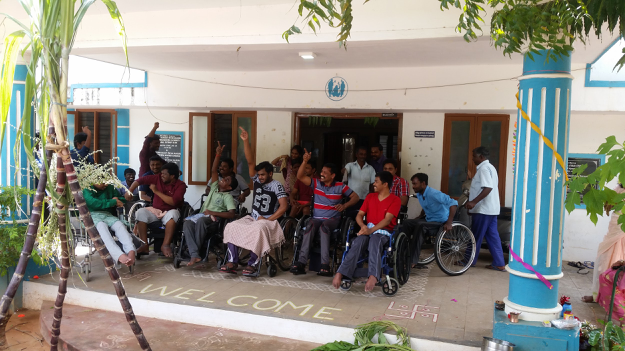 ASSA is a community organization in rural South India run by those with disabilities for those with disabilities. Their motto of “Live to Serve” translates into their services in rehabilitation, education, and vocational training in order to reintegrate people with various disabilities into society. More importantly, what stood out during my placement was the key role of ASSA’s community in facilitating adaptation and building resilience. Within one week, we (3 occupational therapy students (OT) and 2 physiotherapy (PT) students) fell into the rhythm of taking on a caseload; performing assessments, conducting therapy sessions, and stopping for a midday chai. I happened to find a home soon enough in Kanchi Block, the Spinal Cord Injury (SCI) Unit, housing 16 men. The first thing I noticed about these men (which also extended to the ASSA community in general) was a sense of warmth and genuine hospitality. It mattered to them that us “foreigners” felt welcome and comfortable. The second thing I noticed was a sense of brotherhood among the residents. They supported each other when doing transfers from wheelchair-to-bed or vice versa, and they gave each other (and myself) plenty of advice on what type of wheelchair cushion would be best. There were also several instances when I was approached by friends of an SCI resident to talk about his need for a better wheelchair. While I often felt powerless when hearing the dire stories, it was heartwarming to hear these men advocate for the benefit of their friends so sincerely and fiercely. It seemed that these men had connected deeply; they had found solace and strength through mutual understanding of their life experiences, the pain that accompanies such a significant life event, and the ups and downs that come about day-to-day. I have a clear memory of one of the more outgoing residents of the unit having a day when he quietly retired to his room before noon. I saw at least five men wheel into his room individually before they went out to the cafeteria for their lunch; they tickled his feet (even though he had no sensation below his abdomen), asked “enna achchu?” (what happened? ), and tried to cheer him up. Dining together is key a part of community life at ASSA. It was always awe-inspiring to see children and adults enter the barrier-free cafeteria together on feet, on wheels, or on knees and hands with bright smiles and loud chatter. Whether it was a renovation of the temple, a religious occasion, or a statewide festival like Pongal, ASSA found many ways to get people together, turn on some music, and have fun. These celebrations were often quite the buzz around campus and there were many performances or sporting events that allowed residents to participate. Every Wednesday, the OT and PT students would joint the residents in Kanchi block for a Games Night where we played games including adapted volleyball, cricket, and chess.The residents were open to learning new games and they also took great pleasure in teaching games like cricket and carrom to the foreigners. Prior to my placement, I had learned that the Mental Health Commission of Canada had conceptualized recovery from mental illness as being a journey of hope. They contended that recovery is made possible by having a safe space to be ourselves, and to find peers, friends, and family who know and understand our experiences. The social connections built in this community served as motivation, a source of hope, a means to envision new possibilities by watching others like them and to feel understood. Through forming friend groups on social media (and taking advantage of India’s great phone and data plans), the SCI residents were able to carry this source of strength beyond ASSA and into their respective homes. Understanding the value of community and connection is a key piece of learning that I will take away from this international placement. By spending time and really listening to the residents at the SCI unit, I felt privileged to a lot of information and understanding that normally would not reach my ears in inter-professional team meetings. As a future Occupational Therapist, when I wonder how to empower my clients and inspire long-term change, I will remember ASSA’s means of cultivating community and peer networks so that they may be able to empower each other through common challenges. Chamila is Master's Occupational Therapy student. She was born in Sri Lanka, and has lived in Saudi Arabia, Hong Kong, and currently Canada. Her interest in Global Health was very much tied to the idea of going home and bridging identity. She is involved in the SPOT Global Health Rehabilitation Initiative (GHRI) and participated in a fieldwork placement in rural Tamil Nadu, India.